George Clooney’s Suburbicon is a mishmash: two incompatible movies—one archly cynical, the other painfully sincere—wedged uncomfortably together. The foundation of the project is a dusted-off screenplay by the Coen brothers, a mordant small-town crime lark they wrote right after their debut, Blood Simple, and then squirreled away in some studio vault for 30 years. Clooney, who’s delivered some of his funniest performances for Joel and Ethan—they coax a rare screwball energy from his highness—has shepherded this lost Coens caper to the screen, doing his best imitation of their inimitable style. But he’s also made additions to the material, not so much reshaping the script as simply grafting a whole new subplot onto it. The results play like some Robert Zemeckis splicing experiment gone wrong, as though Clooney had somehow digitally inserted an earnest social-issues drama into a zany mishap noir. The title has a dual meaning. It refers, for starters, to the film’s setting, one of those postcard-perfect suburban paradises you see in old sitcom episodes and also sardonic parodies of old sitcom episodes. (The movie opens with a cheekily cheerful advertisement for Suburbicon, boasting of its diversity, which basically just amounts to white folks from different parts of the country.) But there’s also, ahem, a con being hatched in this suburb, and it involves Gardner Lodge (Matt Damon, doughy, bespectacled, and miscast), a 1950s family man as seemingly clean-cut as his lawn. Early into the film, two very Coen-ish lowlifes, played by Glenn Fleshler and Alex Hassell, enter Gardner’s immaculate home, In Cold Blood-style, and tie him up, alongside his apple-cheeked son Nicky (Noah Jupe), his paraplegic wife Rose (Julianne Moore), and Rose’s identical twin sister, Margaret (also Moore). It’s a burglary that ends in tragedy, when an accident with the chloroform leaves Rose dead and the family to cope with her loss. Except, was it an accident? The boy starts to wonder. After all, his aunt seems to have taken up permanent residence in the house, effectively “replacing” her deceased sister. And there’s also the fact that his dad seems none too eager to actually identify the guilty parties when the police thrust the two goons into a lineup. All of this plays, in other words, like a retroactive dry-run to the Jerry Lundegaard scenes of Fargo, or maybe a closer relative to Crimewave, the slapstick cartoon thriller the Coens wrote for Sam Raimi in the ’80s. One can understand why the two never really got around to making the movie themselves—their sensibilities have long since evolved beyond this embryonic stage. Still, one might have hoped that Clooney would be a suitable, simpatico alternative. Sadly, the star-turned-director has no real feel for the Coens’ twisted comic alchemy; his own throwbacks, including the Oscar-nominated Good Night, And Good Luck and the turgid WWII drama The Monuments Men, are more reverently referential. Clooney creates a vague vintage aura—Alexandre Desplat’s lush retro score and Robert Elswit’s typically slick cinematography do the heavy lifting there—but he seems lost as to how to replicate the siblings’ sardonic tweaking of old genre tropes. The tone swings wildly scene to scene, from stodgily “old-fashioned” to laboredly nutty. And that’s just the A-plot. 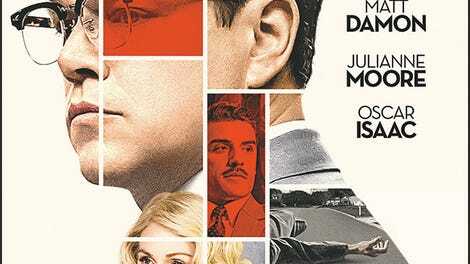 Before taking on this film, Clooney and his regular writing partner, Grant Heslov, were mulling a different project: a biographical picture about William and Daisy Myers, the first black family to move to Levittown, Pennsylvania, causing an uproar—and eventually a riot—among the suburb’s otherwise white population. 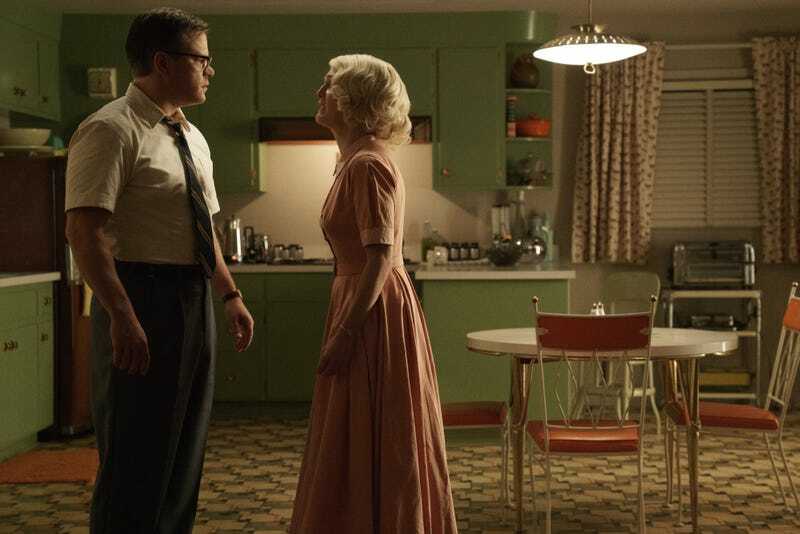 Rather than table that story for a moment, the two filmmakers have awkwardly shoehorned it into Suburbicon, cutting away periodically to the renamed Meyers (Leith M. Burke and Karimah Westbrook) enduring the hostility of their new neighbors with quiet dignity. Perhaps fearful that any Coen-style flippancy would be inappropriate for the subject matter, Clooney incongruently plays these scenes completely straight, which makes it feel like he’s channel-surfed to an entirely different film every time they arrive. The director’s bleeding heart is in the right place: He’s after the hypocrisy of “there goes the neighborhood” racism, leaning hard on the irony of murderous, adulterous schemers daring to express concern about a black family moving in across the street. But the Myers were real people. Here, they’re not even real characters; they exist only to bolster a pretty obvious and familiar point (wait, so ’50s suburbia wasn’t as perfect as it looked?). The Suburbicon of Suburbicon is one of those Norman Rockwell facsimiles of small-town America, just a hair left of Pleasantville on the unreality spectrum. By dropping a real-life story of racial intimidation into the margins of this tongue-in-cheek fantasy, Clooney risks making it look like a problem from the distant past—just an unpleasant thing that used to happen back when America was all white-picket fences and rabbit-ear TVs, and movies looked (kind of, sort of) like this one. Neither of these films, the mediocre Coens caper or the prestige historical lecture, would work like gangbusters on their lonesome, necessarily. Not with Clooney at the helm. But forcing them into direct, clashing proximity creates a deeply awkward mismatch, effectively dimming whatever pleasures might otherwise be identified. And there are a few scattered across Suburbicon, most of them distant echoes of the more confidently crooked entertainment the original writers might have made from a script that probably could have remained un-filmed. There are a great couple of scenes, for example, of Llewyn Davis himself, Oscar Isaac, as a deliciously suspicious insurance-fraud investigator. It’s basically a third movie to add to the gumbo, but for just a moment, at least, Suburbicon looks like the lost Coen classic it wants to be. The Coens swipe at religion, counterculture, and Hollywood in Hail, Caesar!